It's Web Wednesday and it's the end of January; so much to do. At the beginning of the month I promised myself that by the end of January I'd finally figure out how to post to Soctopia's Flickr account and to the Warm Hands Wordpress account. I'm a Typepad gal, so these other blog programs are all foreign to me. Next up, SAM3 will require learning using old Blogger (not new Blogger). I may get confused. Maybe I should learn to do this in code. Today was the closing day for SP9. The big reveal! 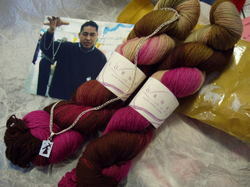 First, my Spoilee was Ghostknitter; Chrissie lives in Singapore. At the beginning of the exchange she asked if it would be possible to WISH for KnitPicks Options. On the one hand, with the holidays coming up, a one time BIG parcel would be nice (for me). On the other hand, a one time BIG parcel meant I wouldn't have the fun of picking out and putting together individual smaller parcels. In the end, Chrissie's happiness convinced me that I'd done the right thing. Next, my Spoiler has been Whining Procrastinator. She is the one who has been sending me all of the wonderful sock yarn to feed my obsession (not my stash since sock yarn does not count as stash!). I'm looking forward to getting to know her via her blog in the coming days. If you have some time on your hands...stop over at Dave's. His sidebar includes "I'm keeping an eye on" with one of the most exhaustive lists of knitting blogs that I've had the pleasure of reading. If you are impatient (like I am) Interweave Knit's Spring Issue preview is available. 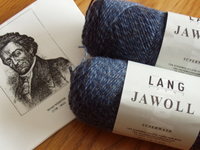 Isn't it cool that they provide us with the yarn requirements so that we can have the yarn on hand BEFORE the issue arrives so that we can get RIGHT to the knitting! IF you read this before Feb 1 (which would be something) Favorite Color Swap 2 is closing sign-ups as of today (Jan 31). It's a quickie swap- all items must be mailed out by Feb 28th. I just found it today and sign ups end today, but I'm game. And finally, as if producing a baby and organizing another Sockapalooza (no word yet on sign-ups) wasn't enough for Alison to do; look, a book! May 2007, we have to wait until May!! I think it's time to set up my Amazon Wish List otherwise I'll never remember all the books that I want. The web can be a wonderful form of inspiration. 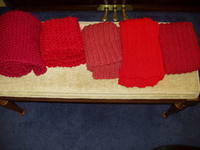 I've never been "big" on scarf knitting, but the Red Scarf Project was a great motivator to knit scarves. Five are on their way to some deserving college students. With the recent cold weather, they'll need them. The two on the left were contributed by Fairy Godmother. The three on the right, I knit thanks to further inspiration from Harlot (One Row Handspun Scarf) and Hello Yarn (Irish Hiking Scarf). 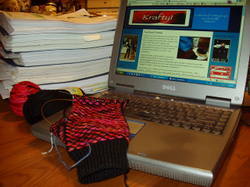 I finished my mittens on Sunday and have been waiting to cast on socks until I found out information re: the recipient. I "should have" cast on the sleeves to my cardigan but I saw this dishcloth at Trek's and felt the urge to make the same. 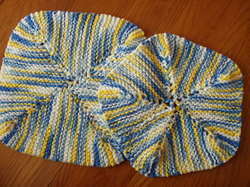 It's Abigail's Dishcloth Pattern and was quick and easy. However, I wanted to try to make one a bit smaller and cast on 15 stitches instead of 19. However, four repeats wasn't enough to "close the square", but a fifth repeat made a wonderful little pentagon/starfish sanddollar for my kitchen. Thanks Trek and Abigail. While we're on the topic of Web Inspired Knitting...Knitty Extras have been posted. Dragonfly (sweater) and Mad River (mittens) do not tempt me BUT I have already shared Elbac (scarf) with Fairy Godmother and am considering making Thermal (underwear) to keep me warm! You never know where the next "inspiration" may come from! Two lovely bits of mail arrived today. First of all, my SP9 sent Vera for a visit. I have been such a fortunate pal! There are six new pair of socks in my stash; well at least the yarn for six new pair of socks. Black Pearl and Vera from Lorna's Laces and four different colors and types of blue yarn. I have been totally spoiled and can't wait to find out who my pal is! The other package: my Mom sent me something from Mexico. Yep, a new silver cross. Fitting. 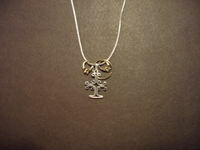 The St. Nick's cross was from her trip to Scotland;this one's from Mexico. I can't wait to hear the story for this one. It must be a good one since she also took a photo of the salesperson. Can you tell that my family is big on personal reminders!?! Small reminders are rampant in our "clan". It seems KC has developed a knack for it too. Check it out. 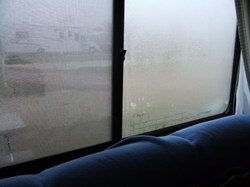 Notice the Smiley Face on the window. My parents are traveling through the southwest. KC left them a "reminder" that she is thinking of them. I bet my Mom won't wipe it off (unless she HAS to) until they get home again. I can just imagine the first morning that my parents saw it! You never know where reminders will pop up! Well, I decided to see how far I'd get...with one skein of yarn, that is. The 100 grams of black managed to produce two mittens of the largest size and part of one thumb. Time for a spit splice to finish off the mittens. Ta Da! My new walking mittens are finished. 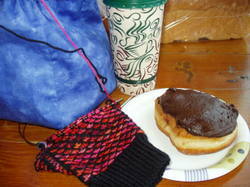 Unfortunately, even new mittens weren't enough to encourage me to head out for a walk today. Temps JUST in the double digits proved to be less than inviting. I decided to accept the progress I'd made this week, including a 2.38 mile walk/run with Panda on Saturday. (8.47 new miles/25.48 total miles) Four weeks down, twelve to go...I'm on track! That's hot! Remember Monday when I said that losing my necklace was a sign that I needed to take care of something? The "something" was to find and get in contact with someone from my past- 25 years past! My family knows that I believe in paying attention to the "signs" I am given, and so I did. Last week I thought of a friend of mine; a flashback. I couldn't imagine why I'd had the thought, and quickly cast it aside. On Monday morning, he crossed my brain path again. I pushed that thought aside too. Then I lost my cross. In high school he'd lost his cross and I'd helped him find a replacement. There he was a third time and I could avoid it no longer. Since Monday, I have been trying to find and make contact with him. This morning, the planets aligned and we talked on the phone for the first time in probably 10-15 years. This afternoon, I picked KC up from school and she was wearing this! A teacher had found it in a snow bank along the street/sidewalk where I'd walked. I don't know when, I just know that she heard that KC had been asking about a necklace at the school office. They contacted KC this afternoon. I can't begin to tell you how excited I am to have this back!!! The cross is my St. Nicholas cross. (St. Nick is my patron saint.) My mother brought it for me from Scotland fifteen years ago. The thin gold band is Panda's baby ring; she wore it when she was a toddler. The two matching rings are birthstone rings for each of the girls. This is my "treasure". Thanks to all of you who have put your good thoughts, prayers, wishes into the universe for its return. Monday I will find out which teacher is deserving of my thanks, some chocolate and more than likely a pair of socks. ...you know what that means...What's on the Web? First, filed once again under "a day late and a dollar short", I discovered the Palette fair Isle Cardigan Knitalong. It appears that it's been out there since September. Sure, I find it when I am down to steeks, sleeves, and edging. 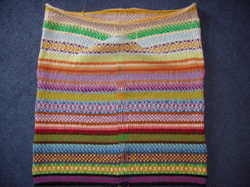 I know that a few of you are considering knitting this cardigan and will want to check it out. Meanwhile, considering how long it took me to get this far, maybe I'd better sign up to ensure that I finish up! Speaking of socks, look what we have to look forward to, a new book by Charlene Schurch. I'm just disappointed that it doesn't come out till the end of March...I have a birthday the end of February. Speaking of March, March 3rd starts Round One of The International Knit Off 2007. Yarn Monkey is at it again. It's always amazing to me to see what the community of knitters comes up with to keep each other motivated and challenged. Me, I've spent most of the day and part of the evening challenged by that pile...5 years of corporate tax returns! 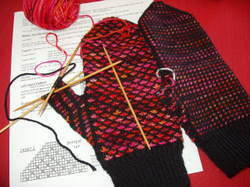 The mitten knitting is the progress from yesterday. I won't get to knit on it much tonight. But, while I'm thinking of it, thank you for all of the kind words and motivation you've shared with me about my lost necklace. It has been encouraging. Thanks. Before you ask, yes, I walked again today and retraced my steps from yesterday...still no necklace. I called the grocery store, again; no luck there either. I'll keep retracing my steps and adding up the miles spent "in search of": motivation comes in some very strange forms. Besides, I needed the walk to counteract that lovely mudpie. Good thing Tuesdays only come once a week! Well, last week was NOT a good walking week for me. The days were too cold to walk through the neighborhood and the nights were too busy to get to the fitness center's treadmill. I managed to eek out just a few short miles(3.25 new/17.01 total) of walking (outside of my everyday "running around"). But, I'll press on. The other parcel was from my "3rd Daughter" as a thank-you for the knitting lessons I shared with her last October (along with a few emails and phone calls since). She has become quite the prolific little knitter. In the 2+ short months since I showed her how to do her first hat she has been knitting up a storm and collecting a number of binders full of "to-do" projects (she has been sucked into the "dark side"). Recently, she knew of a needle sale and called to ask if there were any sizes that I was missing. Why yes; size US7 DPNs. 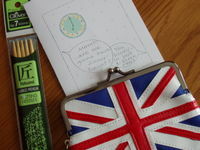 Imagine my surprise when the envelope also included this Union Jack clutch. BUT, there was more; what's a clutch without something to clutch!?! Inside, I discovered a Star*bucks gift card. (Didn't find that until AFTER I'd taken the photo.) Good "daughter" knows that this "mother" NEEDS her caffeine! First off, this one is for you Robin. She's been wishing for snow and complaining that VA hasn't had a blizzard since 96. Well, this wasn't a blizzard, but it was enough snow for one day. 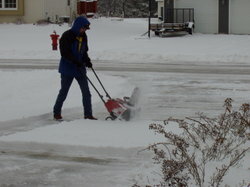 Gee, the photo looks kind of familiar, almost like the one I took on Dec. 1, but we had more snow that day! What to do with a snow day!?! Knit, of course. Finally, finally, the fair isle body is finished. It's only been five months since this baby was started. It was put aside for Christmas knitting, but now it's time to finish it. This baby is ready for steeking. Oh yeah, and sleeves. Sooooo, I'm off to Sleeve Island. It's one of the rare times that I actually hope that my trip doesn't last long! Brenda is back! There is a new episode of Cast-On after six long weeks of waiting. I usually listen to the podcast while working at the office, but since I was home today (and habits are hard to break) I did a slightly different kind of work while listening. 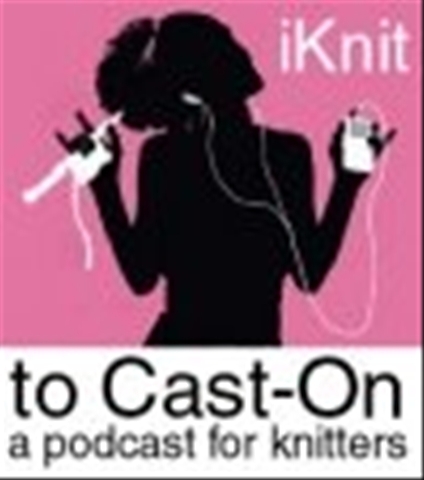 Listening to the podcast was the perfect opportunity to finally get my library of knitting books listed on LibraryThing. My library isn't huge, only 47 titles, but I'm happy with it, so far. One of these days I'll get my Amazon Wish List set up. Maybe during another episode of Cast-On.